Hello friends! Are you in summer mode? For some reason it took me a while to get there, but this weekend I officially dove in to the summer feeling! This weekend included a trip to the farmer's market, antiquing, laying poolside, enjoying the local ice cream parlor and grilling out. If that isn't summer to a tee, I don't know what is! 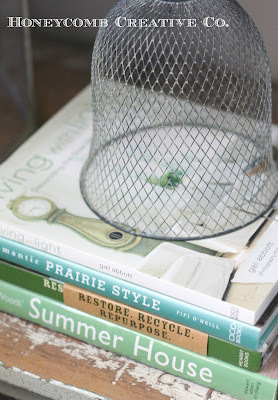 That also inspired some changes to my decor. I have hardly touched my living room (or much other decor) since after Christmas just because life has been so full, so it felt good to finally add some new touches and a fresh look. 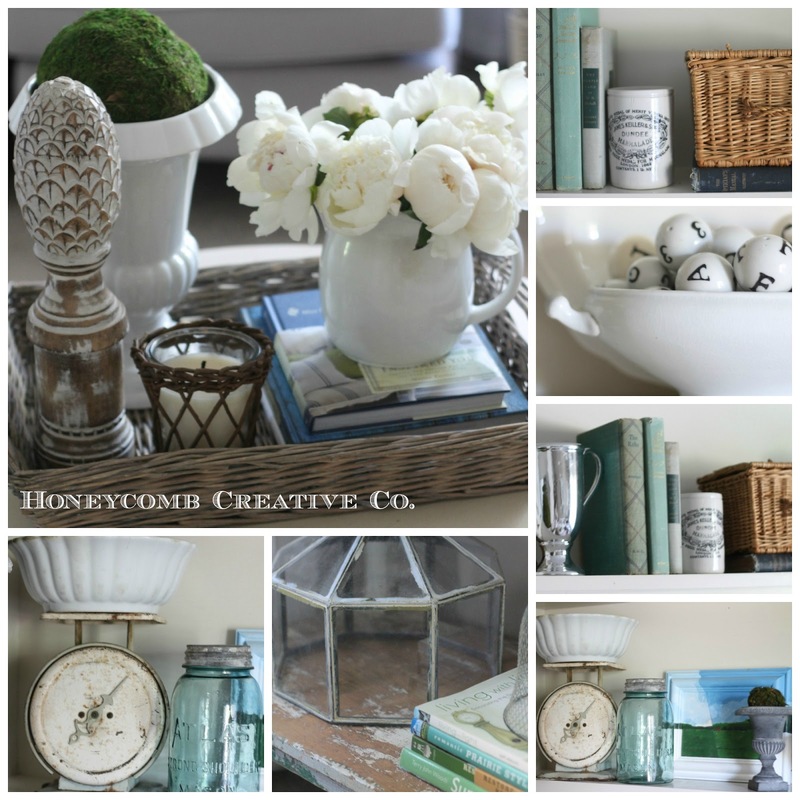 I was feeling the greens, blues and aquas of summer, and tried to add pops of color throughout the room. 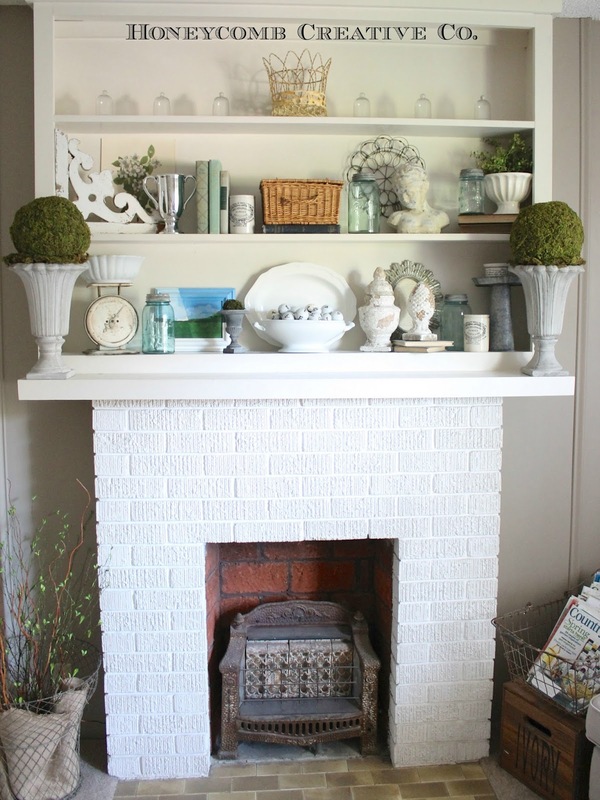 The main hits of color came on the fireplace shelves, where I mixed aqua canning jars, green books, a landscape and wicker for that summertime feel. The side table hasn't changed much since the last time I shared it. 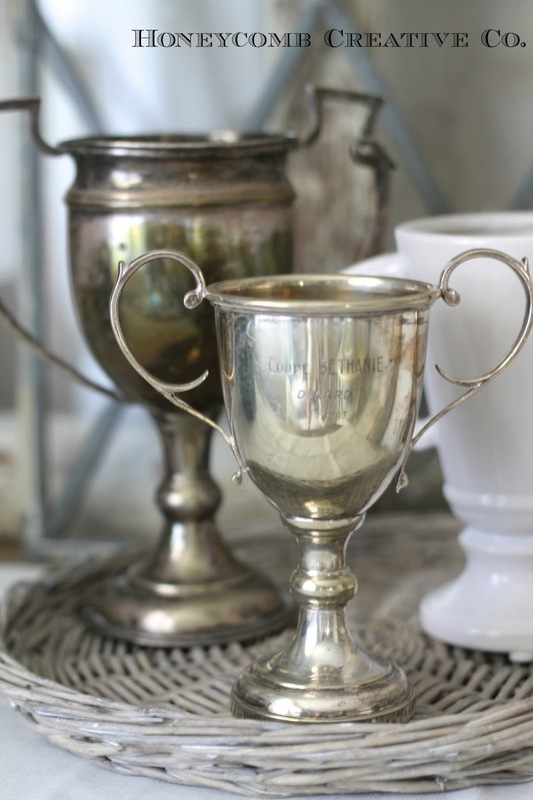 I'm still loving the trophies, French leaded glass window and large finial, which were all finds the last time I went to Bottoms Up Antiques in KC. I get to go back in July and I can hardly wait! 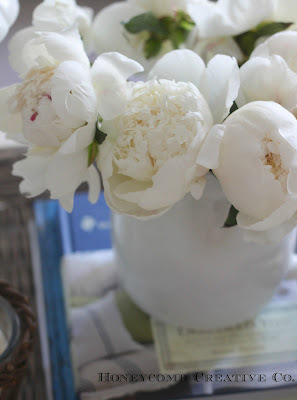 At the farmer's market this weekend I picked up a bunch of gorgeous white peonies. Other than hydrangeas, these are my very favorite flower. They smell heavenly and are still unfolding to their full size. 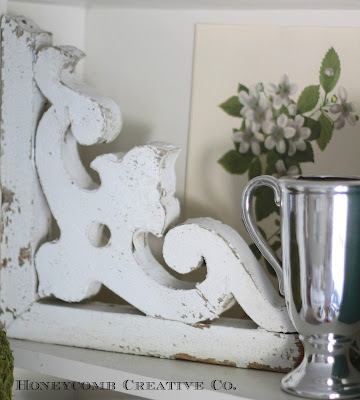 I absolutely love architectural salvage and this corbel has such a great design. The vintage botanical print was one of several I picked up at the flea several months ago for $1 each. This is my favorite shot. I love all the colors, shapes and textures going on. 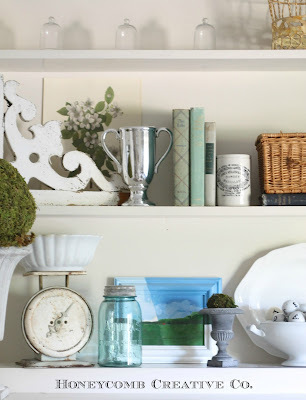 The little blue and green painting was a gift from my papa, who is a fine art painter. It's one of my most treasured possessions. 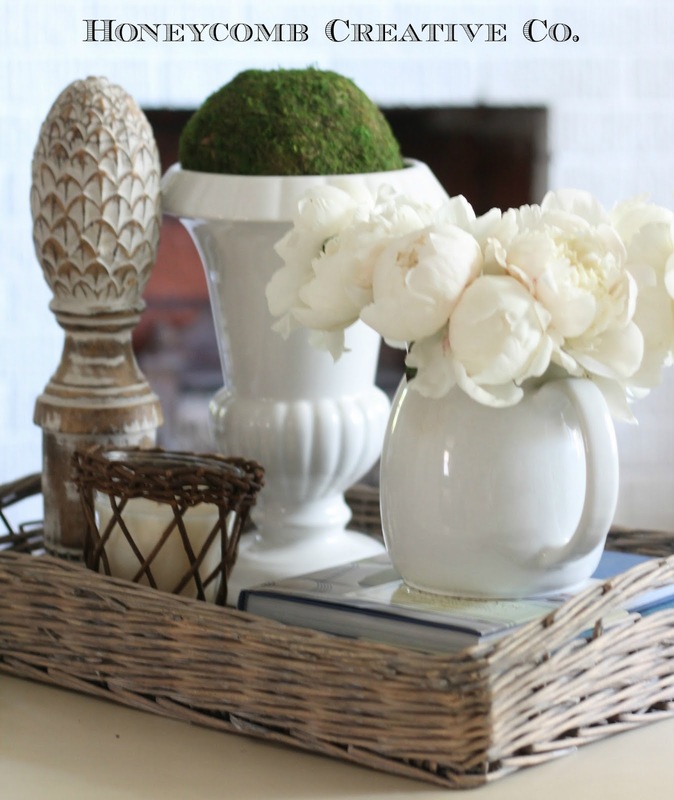 I recently picked up this wicker tray and the candle at my favorite local boutique. 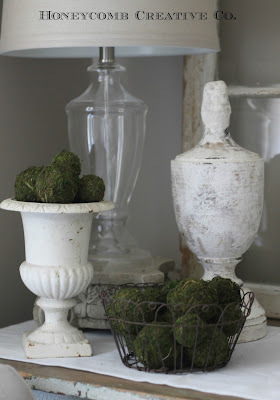 I love the woven container of the candle and it smells delicious (it's the Farmhouse scent from Park Hill Collection). 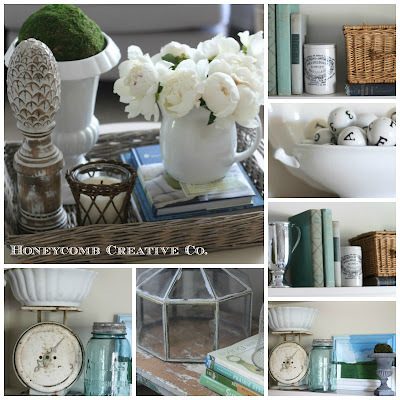 Even some of my favorite decor books added to the blue and green theme. I just could not get enough photos of the peonies and wicker! 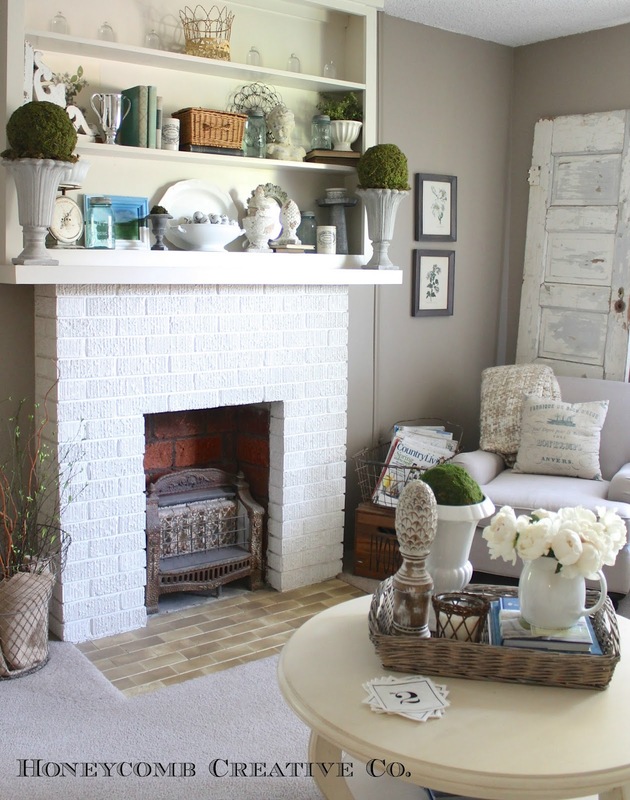 It just goes to show that you can change the look of an entire room with just a few accessories and pops of color. Welcome, summer! Looks so beautiful Courtney!!! I love all of your vintage windows and doors. I adore you space! Wouldnt want to leave it! Thanks for sharing! Saw your home tour on Aimee's bog and I love love love it!! I have a sectional and mad sewing skills, but I also have a sticky fingered three year old and his big brother, so I'm holding off just a bit longer on my white slip covers! 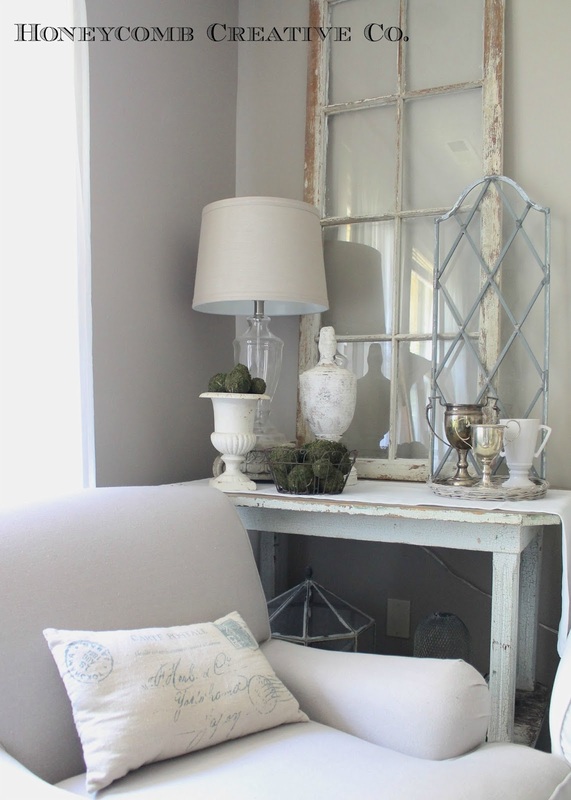 I love all the soft whites and neutrals...you have amazing style! I hope you get lucky enough to find a home with as much charm as your rental! Thanks Christy! 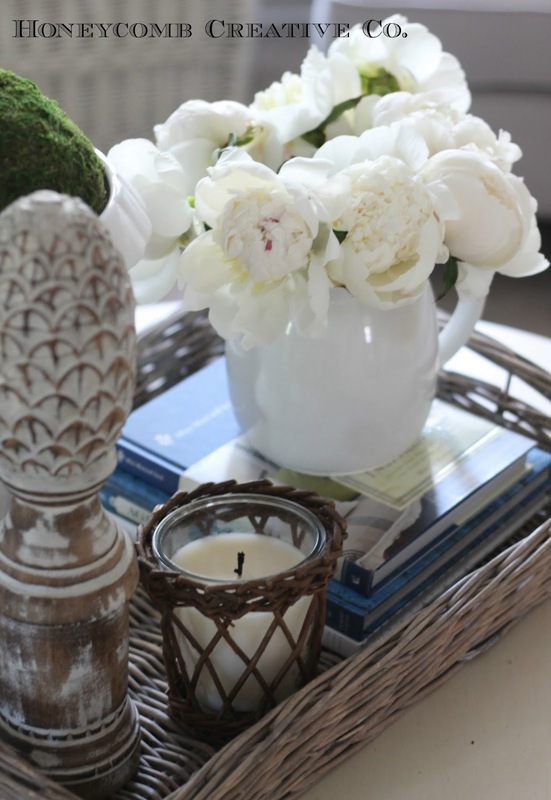 I don't have kids yet, and everyone always jokes that I will change my love of white once they come along. I guess I will find out when the time comes, but I have read lots and lots of blog posts from mommies with little ones who actually like having white with kids more because it's easier to see the messes, and you simply wash the slip cover or bleach the mess. 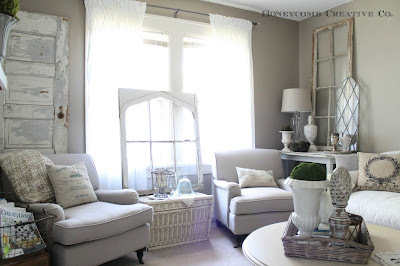 I have always been determined to stay with whites (as long as they're easy-care items like slipcovers) once I have kids, so we will see how it goes. I'm a big proponent of having the home you want, not just dream about having it someday. That is why I've worked so hard on making a 900-square foot rental beautiful. I don't think any of us should have to settle because of budget, space or kids - anything can be done with a little creativity and determination! : ) Ok I'll get off my soapbox now haha! All that to say - maybe you should go for the white slip! : ) Thanks for reading and I hope you have a great weekend! Such a beautiful and calming room! 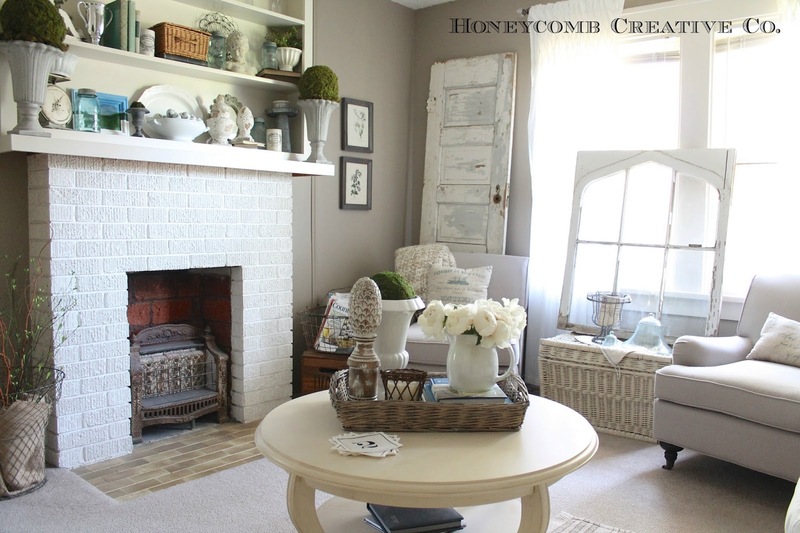 What is the paint color you used on the walls?